So, I'm driving down the road last week and I start wondering 'what if'. 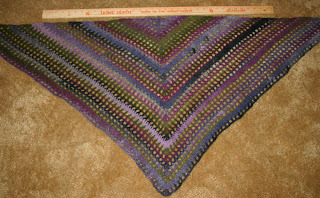 What if I took some Noro Kureyon, made a lacy shawl - the Sock Yarn Shawl, to be exact - and then felted it. Would I get a lacy design? Would the holes felt together? Would it have drape or just be a blob? One thing led to another - I had one skein of Kureyon #188 that I loved - so I made it into a sample and took it to my LYS today to see what they thought of my 'what if'. Opinions were overwhelmingly positive; several thought the felted fabric would make the perfect shawl for Ventura's damp summer evenings. Not to add pressure, but since I'd come up with this cool (to me anyway) idea - why not enter the shawl in the Ventura County Fair? Of course, the deadline for entries is tomorrow, but why worry about details? A little less than eight hours and four skeins later, I had a crocheted shawl. And twenty minutes after that, I had a felted shawl. 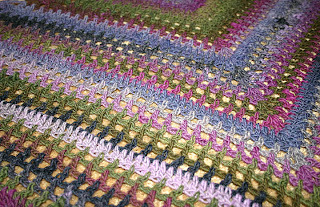 Felting also fixed one of the major problems I have with Noro yarns. I love the colors and the patterning - nobody does it better - but their yarns are often hard and wiry, with little twigs and other debris intertwined with the fibers. Felting softens the colors but it also softens the yarn. 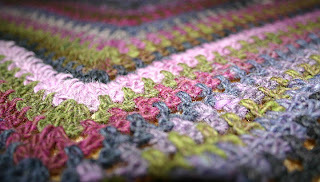 A Noro shawl would not be tops on my list for next-to-skin wear. 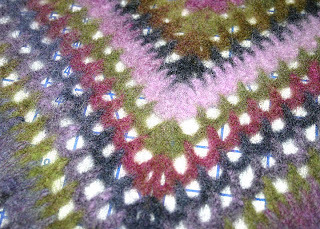 A Noro felted shawl? Oh, yeah. Can't wait to wear this baby. After the Fair, of course. Really beautiful, and what a terrific idea! Oh, I adore it and am making myself one immediately!